Take That were greeted by screaming fans as they turned out on the red carpet for the official opening of the band's musical. 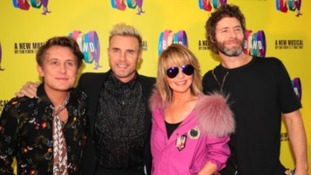 Mark Owen, Gary Barlow and Howard Donald took selfies and spoke to adoring fans who gathered outside Manchester Opera House ahead of the press night for The Band on Tuesday. Barlow told the Press Association how he brought back his bleached blonde hairstyle in honour of the occasion. It's especially for tonight. I thought I'd give it a bit of 90s, it's all back now isn't it? Having said that, it's a brand new show as well. All of a sudden these songs that we've sung for years and years, it kind of gives them a different meaning. The show was produced by Take That as well as David Pugh and Dafydd Rogers, and directed by former EastEnders actor Jack Ryder. Owen said he was proud of the team involved in the musical, including writer Tim Firth. Our music's involved in it but in many ways we are sort of riding on the coattails of everybody else. It's a nice thing. Donald praised the loyalty of the band's fans who had turned out to see them on the red carpet. It's amazing. We see so many faces from the tour and it's an absolutely amazing turnout, it's overwhelming. The show stars boyband Five to Five - winners of BBC talent show Let It Shine - and the programme's presenter Graham Norton were among the famous faces on the red carpet for the press night. Lulu also showed her support for the band, who she famously sung with on Relight My Fire, and said she was "excited" to watch the musical. Music always reminds you of a moment in your life and there'll be a lot of them tonight. [The fans are] louder! The older ones are really loud! The Band is set to tour the UK after its initial run in Manchester.